Today it’s my joy to welcome Five Minute Friday community member Katharina von Dessien. I recently received an email from Katha about a friend’s project, and in her message to me, she shared, “I just signed a book contract and I can’t wait to share it with my writing friends! 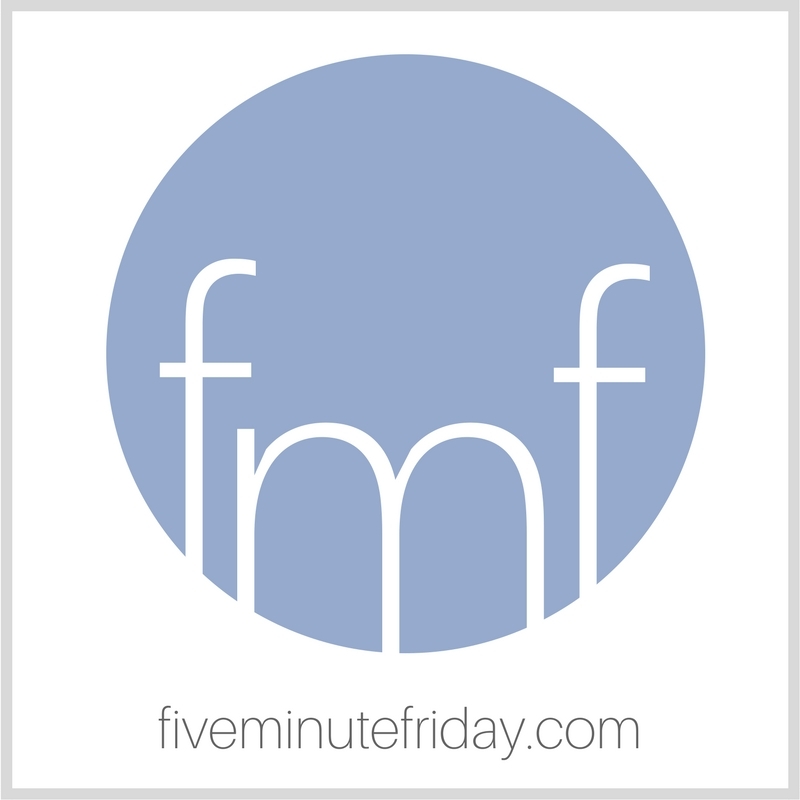 This definitely wouldn’t have been possible without my FMF writing inspiration!” Naturally, I wanted to hear more about how Five Minute Friday has impacted Katha’s writing life, so I asked her to share for all of our benefit. When I was in fourth grade, I wrote my first book. Well, technically I rewrote the story of Anne of Green Gables, a quirky girl who ends up in a small town with rather pessimistic people. Through chronic optimism and joyful demeanor she manages to turn this town’s perspective around. My book had two copies, one for my teacher, one for my parents. After that, my writing was buried in years of journalistic experiments, traveling the world, growing up. About four years ago, I wrote my first post for Five Minute Friday. I was so nervous about the words I had strung together in such a short amount of time and now had to share with the world. But I had nothing to fear because they ended up with a great community of fellow writers. My initial wobbly steps were welcomed with encouraging feedback, my first feeble attempts with uplifting comments. Writing once a week has changed how I view the world and sharpened my perspective. I see nature’s diversity, I listen to people’s stories, I taste a meal, I enjoy good company and I find…God. He’s the greatest storyteller and I just have to watch how He unfolds and creates beauty in our lives. When I write, I mostly preach to myself. Be still, my soul and see beauty. Look out for my wonders in the mundane narratives of your life. And yet, when I hit publish, these words become so much more. They establish a connection between two strangers who get to marvel at the world together. They turn perspectives around, so that others are brave enough to find God in unexpected places. They echo in people’s lives in ways I had never intended. The Five Minute Friday writing community is a little bit like Anne of Green Gables. With perseverance and optimism, with quirkiness and a joyful demeanor we manage to turn each other’s perspectives around. The one who grapples with grief – we mourn with you. The one who asks deep questions – we wait with you. The one who rejoices over life’s goodness – we celebrate with you. The one who takes a risk and believes in a dream – we cheer for you. A few weeks ago I signed a book contract. It will be in German (sorry, people! ), but I pray that many readers will encounter God in unexpected places over here through my writings. When I shared the news I was blown away by all your many thoughtful comments and encouraging messages. THANK YOU! This community has made all the difference. I have met some great writers with unique personalities behind that, and sometimes I’m sad that there’s an ocean between so many of us. I am always amazed how we all write on one prompt and yet end up with completely unique perspectives. No matter if you’re an FMF veteran or just started out – keep writing. No matter if you write for a book deal or for your own sanity – keep sharing. No matter what style you prefer – keep putting that pen to paper (or rather, fingers on the keyboard). Poems, psalms, stories, jokes…they all show something about us, and that’s the greatest gift we can give. As a Third Culture Kid, Katha von Dessien has seen quite a bit of this beautiful world. She has always been most impressed by people who challenged her view of God, herself and others. She lives and works in Stuttgart (Southern Germany) where she loves to invite people and listen to their stories. What she learns about God in her mundane narratives, she shares on her blog. Her first book about finding God in the ordinary releases in September 2017. What a beautiful perspective of giving and connecting through our words! You inspire me to join FIve Minute Friday more consistently as a way to just keep going and contributing and connections and being part of ciimmunuty. Thank you for your inspiration and testimony and congratulations! May God give your book wings to the very places and people He wants it to go!!! Thank you, Shauna! Consistency really is key and not worrying about every single word! First off, Congratulations to you and your book contract. Praying for incredible blessings for it and for you. This is an inspiring piece, Katha. So glad to be in community with you. I love what you say about mostly preaching to yourself. I find this of my blogging style as well. Mostly things I need to be reminded off daily. Thank you for sharing your writing story. This is encouraging and uplifting. Have an incredible week, friend. Yes, it’s really about reminding myself and sometimes someone just needs to speak it out loud and others can relate. So let’s be brave with our words! Congratulation! How exciting and rewarding! Yours words are like those that brought me here. I know God had a hand in it. After a sporadic hiatus from writing due to health, family and right out life issues, I began searching for bloggers for inspiration again. My words these days don’t come as easy and I’m not sure when they won’t appear in type any longer, with the early onset of what just might be what I like to call a form of dementia. I started this blogging journey to express what the journey would be like with IBM, and after 13 years, so blessed that it still remains at a slow progression. It then turned to family, drama, and test and test of what next. I have no college courses or a degree in writing or journalism. I’m basically, a by the seat of her pants kind a gal. Learn as I go, as I need, and as I can retain and remember. We’ve developed a system that works for now. Brain games are my best friends. And God is my Savior. Two years ago I was approached to “Tell my Story”. How, sent me into shock, the anxiety, then shock! I hope that in the future, be in near or far, I can be where you are, announcing that my book is being launched! God only knows if I will remember it! What a story, Elizabeth! Continue writing, especially when it’s hard. It’s not about the product, but the process (even if it remains unseen to the public). Katha, I loved this post. You’re so right. FMF has been transformational for me as well. My perspective has been broadened by reading the words written by fellow bloggers and linked up here. Yes, it’s incredible to read what others make of the prompt! Each piece is unique! Thank you, Jeanne! It’s always an honor to hear from a fellow author! You can still learn German until the book releases in September. ? What a great post. Congrats to you!! I am so excited this will be in German. The whole world needs encouragement and hope. I really appreciate you sharing here. I love reading about other’s experiences and they are all so unique! Thank you, Meghan! I’m excited to see where this journey will lead me.